The sun which had been shining so brightly through our bedroom window earlier had managed to hide itself behind some clouds as we bade farewell to the the Greyhound Inn and left the village of Wigginton. 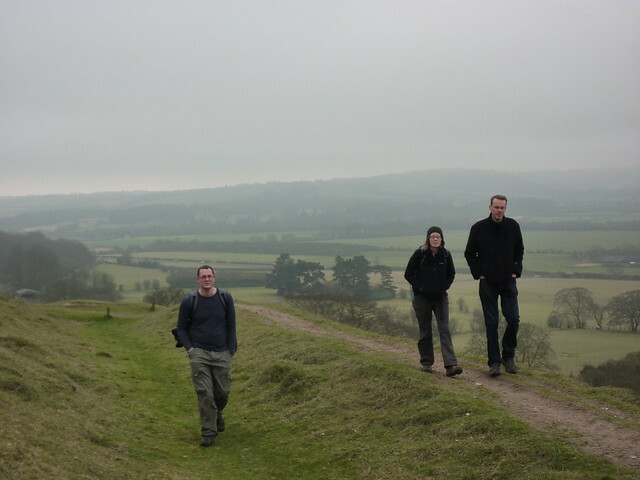 Now joined by Tal’s partner Jenni, who’d been unable to join us on the previous days walking, we headed out for our destination: a mere four mile walk to the end of the Ridgeway at Ivinginghoe Beacon. A prominent hill, and once home to bronze Age fort, our route would lead us over a few more modern additions to the landscape, starting with the busy A41 road whose dual carriageways noisily allow the driver of the automobile to get between London and Birkenhead, should they wish. The Sunday morning traffic was light, but there was at least no need to play Frogger as the Ridgeway was grandly carried over the road. That was left to the neighbouring A4251. Now replaced by its neighbour, this road follows the line of an old Roman Road known as Akeman Street, which allowed Roman army to march between St Albans and Cirencester, via Hemel Hempstead. From there it was just a short hop to another form of transport as we passed by Tring railway station, sited two miles outside the town it claims to serve. As the Ridgeway crossed over the railway tracks (via the safety of a road bridge) I stood and looked down the West Coast Mainline, willing one of the fast Pendolino trains to thunder by as it whisked its passengers to Scotland, Birmingham or Manchester. Maybe some would even be going to Birkenhead. Faster by rail than the A41 after all. The station’s actually far closer to the village of Aldbury, a quaint village surrounded by a pond that looks like the kind of village that would be used for filming an Emma Peel-era episode of the 1960s cult drama, The Avengers. And funnily enough it was, staring as a village where people could be sent to be murdered. The Ridgeway doesn’t have any truck with such modern nonsense though and leaves the village be, instead heading up through Aldbury Nowers. A 20 hectare nature reserve with a curious name, the path headed on through chalk grassland and woodland; gaps in the trees occasionally giving glimpses of nearby Tring. Nearby Pitstone Hill gave even finer views before the Ridgeway headed over to a car park and on to the National Trust’s Ridgeway Estate; a crimson warning sign politely telling those visiting that the land was once used for military training, and that anyone seeing anything suspicious should give it a wide berth and inform the estate office. Despite the grey clouds now covering the sky, plenty of people had parked up, and were now making their way up the line of hills that would ultimately take us up to the beacon. Go up one then head up along a simple ridge to the end at the Beacon. As we steadily climbed the path, we looked over to the a steep side of Incombe Hill where a runner was busily exercising. Up the sharp incline he’d run, almost to the top, before pausing momentarily and heading back down again. As we watched him go, the general consensus was that he was mad and that was confirmed when, at the bottom, he started making his way back up again. This time he was followed by his dog, a small black terrier which must surely be the fittest dog in the South East. Shaking our heads with disbelief we headed on through the woods of Steps Hill, then across a road mostly filled with walkers. 0.3 miles to the end the final Ridgeway signpost proclaimed on one side. 87 miles to Overton Hill it muttered on the other. It was the last push; our rucksacks and hiking boots seeming a little out of place when surrounded by families in trainers and a small girl whose Ugg boots clearly were two sizes too big and certainly not providing anywhere near enough arch support for a growing child. 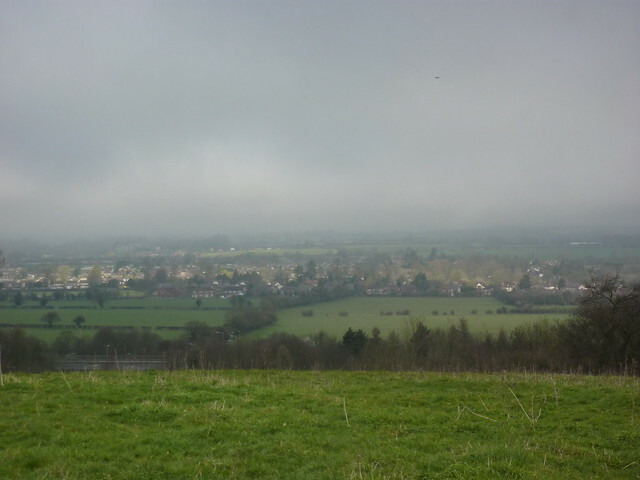 And then we were at the top, admiring a wide panoramic view of the area; the villages and the fields of Southern England. The Ridge had ended. Well, actually the ridge carries on a short way, double backing round to Gallows Hill, but down here at the base that final ridge is hidden from sight. But this was a time for celebration, not pedantry. And besides, the Beacon itself is higher up and thus a more fitting end. 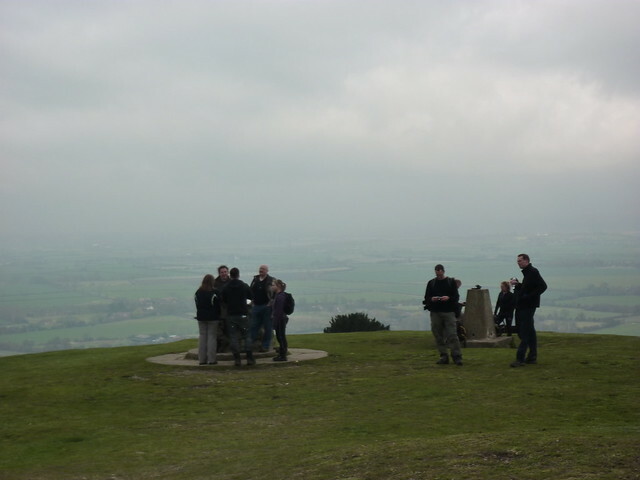 Of course the original trading and drovers road that was the Ridgeway didn’t end at the Beacon. Nor did it start at Overton Hill. In fact it linked Lyme Regis on the Dorset coast, with another seaside town of Hunstanton in Norfolk. A four hundred mile journey travelling with history. But then given it had taken a year just to do a fifth of that distance, that was one journey I wasn’t counting on finishing any time soon. First Published: 24 May 2012. Last Updated: 18 November 2015.